This is our first blog post from Montclair Voices! A new place to speak up about our schools. Let’s jump in and get right to it. PARCC! Is it a new parking regulation? No, it is the new high stakes tests coming to NJ schools this spring. For some background, see this post from TeacherBiz, Dear Commissioner Hespe, Can we talk . We think she hits the nail on the head responding to Commissioner Hespe’s latest statement about the scare tactic options for parents interested in opting out or refusing the PARCC. And for a terrific roundup of even more reactions, check out Marie Corfield’s post, Hespe Opens Floodgates. Parents had a very insightful session with the freshman guidance counselors at yesterday’s “Navigating Freshman Year” night. A parent brought up the question of how to go about opting a child out of the PARCC assessments. The head of guidance at MHS, Mr. Willieneil French said he wasn’t sure yet if we would be able to opt out. Another guidance counselor interrupted and said there would be a Q & A at the end to answer specific questions. Parents were asked to submit questions on index cards. Mr. French responded later that parents will be able to opt out but that they were still working on the process and couldn’t say what that process would be. When will they have an answer for parents? Shouldn’t they have a plan in place by now? Makes you wonder, right? What exactly is our district’s plan for parents wanting to opt their children out / refuse the PARCC? We don’t know yet. event is coming up on November 9, 2014 from 3-5pm. We hope you’ll join us. 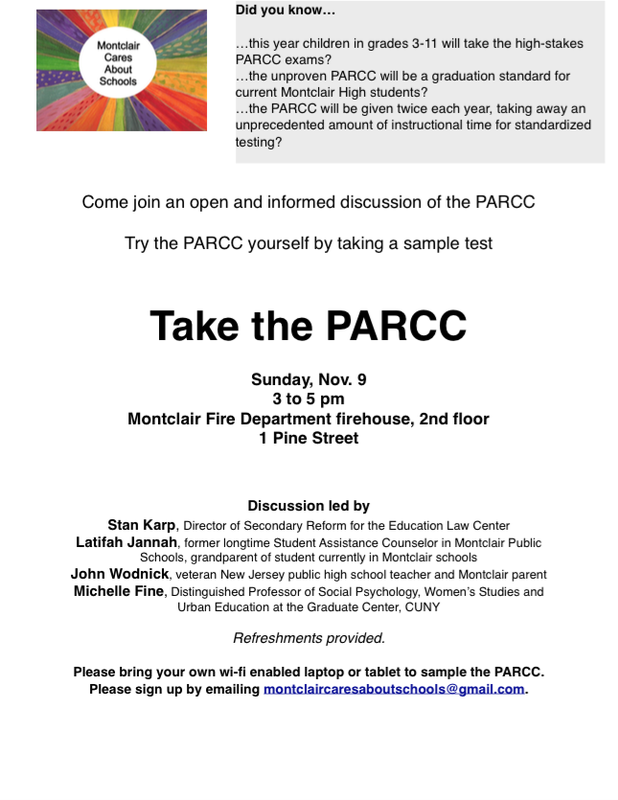 If you can’t go, please consider passing this on to a friend, neighbor, or fellow parent who might want more information about the new PARCC testing. This is a great chance to come see what the PARCC tests are all about –to experience them hands on for your very own self. Participate in a discussion with other concerned parents, educators, and community members who are all asking the same questions you might be curious about. Or just listen. Please know, if you’re confused about PARCC —you’re most definitely not alone! Hespe’s recent statement has galvanized a movement already gaining steam. Together, we can start to make sense of things and work to make things better for all our students and our schools. If you have a story or an idea or art about testing or any topic relevant to our schools, please send them to us for consideration at montclairvoices@gmail.com (for more on this please visit our About page). We look forward to reading your stories and sharing them with others.